Faculty and staff from the University Libraries coordinated a recycling effort to keep 240 pounds of plastic out of the local landfill. SPOKANE : Faculty and staff from the University Libraries coordinated a recycling effort to keep 240 pounds of plastic out of the local landfill. That’s the equivalent of about 7,000 water bottles – or 104,000 square feet of plastic wrap. Lynaire Hartsell, user experience coordinator, identified and weeded thousands of microfiche from the Libraries’ collection. These particular materials contain copies of very old college catalogs that are no longer used. Microfiche are flat plastic sheets, about the size of an index card, that hold very small copies of printed material. While this “micro” format takes up far less space than printed counterparts, it is surprisingly heavy when massed together. Recycling this much plastic isn’t free – the company charges $9 per 30-pound box, plus shipping. But Mary Gilbertson, monographic unit head in Tech Services, and Judy Ganson, director for Collection Management Services & Systems, thought it was important to keep this material out of the landfill. In the end, several Libraries’ departments were involved with the effort. Gilbertson withdrew the materials from the collection and located the recycler, and Brian Curtis and Matthew Kelly from Facilities packed and weighed the boxes. 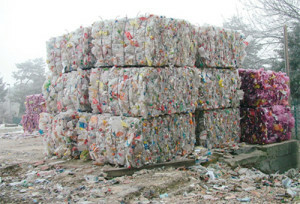 “While recycling the material is more costly, it is the responsible thing to do to help to preserve our environment. Although, the libraries could have saved monetarily by not recycling, the accountability is invaluable,” said Gilbertson. This process has also allowed Libraries’ staff to create a system to recycle unnecessary microfiche in the future. While no plans to recycle additional microfiche are in place now, weeding the Libraries’ collection is an ongoing process and boxes of microfiche can pile up quickly. The U of A is committed to be a zero waste campus by 2021. In the next five years the campus will need to divert 90 percent of our 3,000 metric tons of waste annually from landfills in order to meet this goal. This Libraries’ are proud to help support these efforts.